We started the day early again at our previous morning spot. Our hope was to fish the slack low early since it was more fishable when there was less seagrass. The bite was fairly slow to start this morning. I caught a small Littlehead Porgy almost immediately, but then the bite was slow. I tossed out a dropper loop for a while to fish on a deadstick. I caught a couple of Southern Puffer but no more porgy. 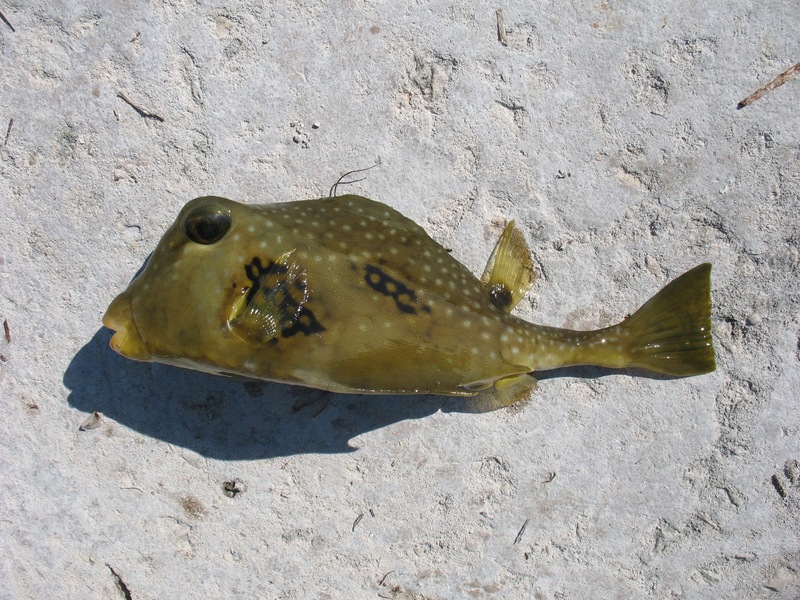 Surprisingly, I found a Buffalo Trunkfish biting! While checking bait and casting out again, I was just setting the baitrunner on my reel and putting the rod down when line was ripped out of the reel! There was a strong fish on the other end and it was pulling decent drag off my Shimano Baitrunner 4500 with 50lb braid and a 30lb dropper loop. The #6 hook was holding fine and I added a little more pressure on the fish. We finally saw the fish and I was super excited. It was a nice Yellow Jack! There were stunning electric blue marking on a golden body…the picture can’t do the fish justice! I sent out my rig again. Another 15 minute passed before there was a good strong run on the baitrunner! I told Michael to grab the rod since I was fishing a sabiki away from the rod. When I got there, the fish had already ran out 1/4 of my spool. I put a little more pressure trying to stop it, but the fish put on a second stronger run. At this point, I was calling either a shark or a ray. Finally, the fish slowed and I was slowly pumping the rod to gain line. The fish came in fairly easily until it saw us. It was a stingray, and it now decided to sit on the bottom. I start strumming the line to annoy the ray and it worked. The ray swam off on a little run again but we managed to hold it close to shore. A few moments of trying to fit it into the pier net…and we lifted it up over the seawall! It has a nasty stinger that I was trying to stay away from getting stung. We didn’t have any more excitement when the tide came in. It was quite hard to fish the dropper loop since the current was full of seagrass. We only had 3 small grunts and two porgy for bait, but we decided to grab lunch and try one of the bridges for the afternoon bite. When we arrived at our bridge spot at 2pm, the tide was still coming in at this spot. We were fishing from the old car bridge. People were casting toward the new car bridge. Michael and I decided to fish in the eddy of the bridge support of our bridge using a dropper loop rig with 3 hooks and a 3oz sinker. We were immediately into a mess of grunts! 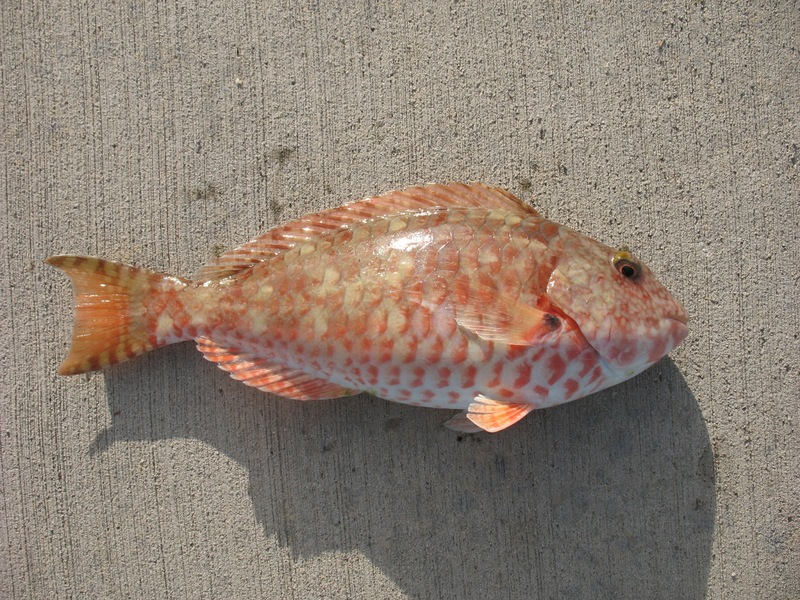 We started off with a few Bluestriped Grunts, but then I found a small Mangrove Snapper. The next fish was a Sailor’s Grunt! We set up a couple of rods to target sharks. Maybe we were a little naïve to start. Michael was fishing a small grunt with 40lb mono tied to a 5/0 hook. I was fishing a 6oz egg sinker on a Carolina rig with 60lb mono leader and 40lb mainline. I put a small grunt on the 5/0 circle hook too. Both Michael and I got picked up and broken off within the first 30 minutes of soaking our bait. Michael saw his shark surfaced and said it was a 5-6 foot shark. I didn’t get to see my fish, but it ran off some line very quickly before breaking me off as I engaged the reel. After that, we set out a large grunt on the 6/0 rig with 180lb leader. On my rig, I tied on 20 yards of 100lb mono rub leader plus a 3’ section of 80lb stee leader. Strangely, neither Michael nor I got another shark hit once we switched to steel leader. It was a little disappointing. While I was fishing the dropper loop, I saw some needlefish follow my bait. They would grab the bait but let go when they felt tension on the line. So I rig up a light spinning rod with 8lb mainline, 12lb fluoro leader and a #14 octopus hook. I put on a small piece of squid and drifted the bait with the current without any weight on the line. The needlefish were quick to key in on the drifting bait. When one of the picked up the bait, I opened the bail to let the fish take line without feeling tension. When I felt the fish had taken the bait far enough, I set the hook into my first Atlantic Needlefish! We caught more grunts on the dropper loop. Whenever we can, we cut up a grunt to send out some fresh bait on the shark rig. While replenishing our grunt supply, I found a female Redtail Parrotfish! Michael was fishing one piling and caught the first of many Porkfish. For some reason, I caught many more Bluestriped Grunt, White Grunt and Sailor’s Grunt but can’t find one of these Porkfish. Michael caught so many Porkfish that he sent one out on a balloon rig when we saw these guys. There was a small school of tarpon holding in the current right at our bridge spot. There were a couple of them that looked to be over 100lbs! The current was outgoing now and the tarpon were facing away from us into the current, so there was no way for us to get a bait to these fish when they were holding under the bridge away from us. When they finally swam around, they passed right by the balloon rig without so much as a look. They were obviously looking for something else to chew on…maybe mullet, shrimp or crab. Toward the evening, there were a few more chunky White Grunts. I could have kept a few for the table…but it was too much work to lug the big cooler of ice onto the bridge. Finally, after cursing at Michael a few times for catching all my Porkfish, I finally caught my first…and definitely won’t be the last. Once I caught my first one, they seemed to be everywhere! The action was good even as the sun sets. After the sun set, the fishing changed. Fish vacated the bridge pilings and were now found about 40 yards from the bridge on the sea grass bed. Annoyingly, Michael kept catching Schoolmaster Snapper without trying. I have yet to catch a Schoolmaster Snapper, but while we were fishing the same rig in the same area, I kept hooking up grunts. When the fish finally stopped hitting, we simply tossed out our dropper loop and wait for a bite. Sometimes, it could be 10 minutes until the next bite. Sometimes, it could be 30 minutes. When I finally had a bite, I found an Oyster Toadfish! We grabbed a couple of camping chair to prepare to fish all night. We were hoping that the shark bite would improve at night. However, the current was ripping all night and we our lines were constantly fouled by seagrass. We had to clear the lines every hour or so, but that also allowed us to send out fresh bait. Between 7pm – 11pm, there were a few guys fishing next to us trying for grouper and sharks. They caught a bonnethead shark using cut herring. When they finished fishing, they left half a mullet and some cut herring on the pier. Michael found their leftover and we changed our baits to cut herring.